of shallow form with undulating rim, resembling an open mallow flower, the recessed center moulded in shallow linear relief with a cruciform four-petal motif within a lozenge-shaped panel with ropetwist border surrounded by feathery foliate motifs, the wide flaring rim decorated with similar foliate motifs in the same technique, all within a narrow raised rim, the underside plain, resting on a high oval ring foot, the fine white porcelain covered with a transparent glaze of pale yellowish tone which drains away from the raised decoration, the footrim left unglazed and neatly pared, the base incised before firing with the character ying. Tang dynasty white porcelains inscribed with the character ying are extremely rare, and recent scholarship indicates that they were produced exclusively for imperial use. A group of inscribed white porcelains, including several pieces bearing the character ying, were excavated in 1992 in Xi’an, Shaanxi province at the site of a Buddhist temple which was famous during the Tang dynasty, known as Qinglongsi. Wang Chanqi discusses the porcelains at length in Kaogu Yu Wenwu, 1997, no. 6, pp. 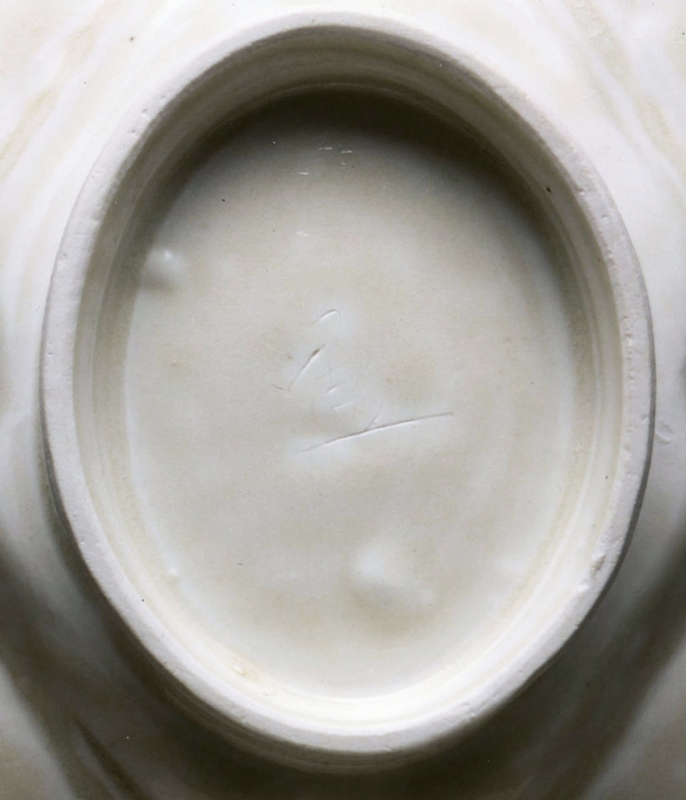 6-12 in an article entitled “White Porcelain with Chinese character ying from the Qinglongsi Temple Site”. Wang concludes that the porcelains inscribed with the character ying were so designated because they were associated with the “Da-ying Ku” (which may be translated as “The Storeroom of Great Abundance”), which is mentioned in Tang historical texts as being the largest and most important of all the palace storerooms during the reign of emperors Xuanzong (r. 713-755) and Suzong (r. 756 – 762) According to the histories, pieces in the Da-ying storeroom could only be used by the emperor himself. The ying-marked porcelains discovered at the Qinglong temple site were most likely sent to the temple as pious gifts directly from the emperor. A white Xingyao ovoid jar with the character ying incised on the base from the Carl Kempe Collection, in the Museum of Far Eastern Antiquities, Stockholm, is illustrated by Bo Gyllensvard in Chinese Ceramics in the Carl Kempe Collection, Stockholm, 1964, p. 103, no. 298. Only two other Tang dynasty white porcelain dishes of this rare form appear to have been previously recorded. Both were excavated in Zhejiang province and both are inscribed with a guan mark. 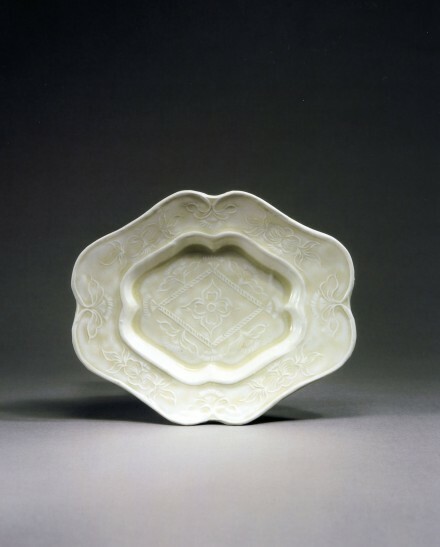 One plain white dish of this form, excavated in 1978 in Lin’an county, Zhejiang province in the tomb of Qian Kuan, who died in the late Tang period, is published in Wenwu, 1979, No. 12, pp. 18-23, and illustrated on p. 24, figs 2 and 3. The second example, also plain, was excavated in 1980 in Lin’an county, Zhejiang province in the tomb of Shui Qiushi, and was included in an exhibition of precious cultural relics held at the Palace Museum, Beijing in 1987 and illustrated in the catalogue, Quan Guo Chutu Wenwu Zhenpin Xuan (A Selection of the Treasure of Archaeological Finds of the People's Republic of China), Beijing, 1987, no. 40.